With modern accommodation, premium amenities and Alaskan hospitality, the Totem Hotel & Suites provides a memorable experience for business and leisure guests. You’ll find space to relax, unwind, or work comfortably in your guest room. 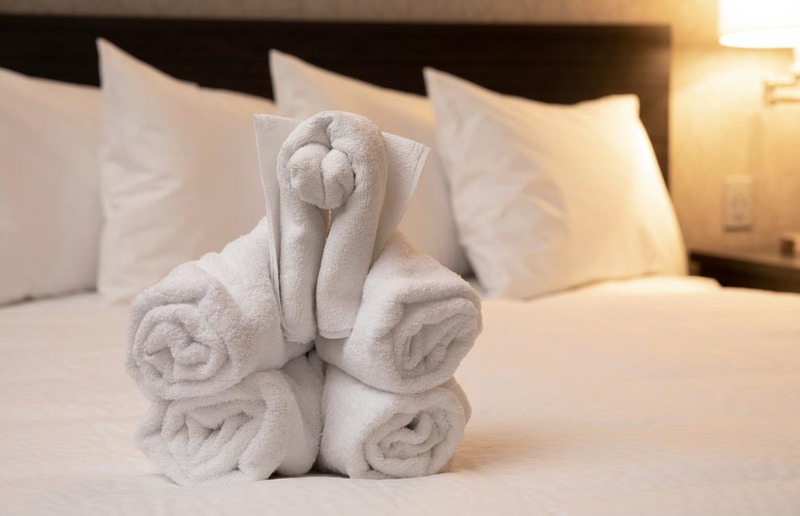 Our custom mattresses are wrapped in premium linens, bath towels are white and fluffy, and the room is furnished with a television, coffee maker, microwave and mini fridge. Choose rooms with one king or two queens, some feature mountain views. Every morning starts with a breakfast buffet that offers comfort food and healthy options. Served daily from 6am to 9am in the great room. From the moment you walk in the door, our staff will be there to make sure you enjoy your stay. Each room with king bed and sofa bed offers space and modern amenities, including microwave, coffee maker and mini fridge. Each room with two queen beds offers space and modern amenities, including microwave, coffee maker and mini fridge.